Heat and power generation in biofuel engine cogeneration plants has become increasingly important as process industries look for more economical and environmentally friendly ways to produce energy. Compared to plants powered with fossil fuel, biofuel-fired plants produce energy with a greatly reduced carbon footprint. Flue gas produced by incinerating biomass such as paper, wood chips or animal waste contains environmentally harmful byproducts along with valuable heat energy and water vapor. Many of the byproducts, such as ammonia or heavy metals, are strictly regulated, resulting in significant discharge and disposal costs that must be borne by the power station. The water vapor and the heat energy, however, can be recovered from flue gas for re-use. 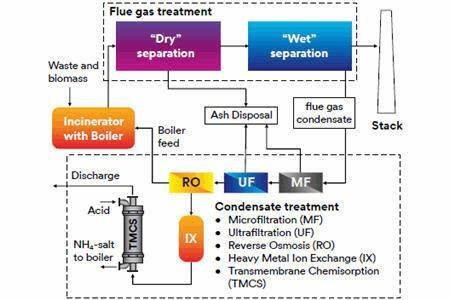 An integrated cleaning and recovery system that incorporates 3M™ Liqui-Cel™ Membrane Contactors for Transmembrane Chemisorption (TMCS) may reduce compliance costs associated with ammonia abatement from wastewater with minimal maintenance.